Fort Wayne has been blessed with several high-quality educational institutions. The great part is they don&apos;t just serve their respective students - each one offers opportunities for the public to become engaged. Here are a few ways that you as a visitor can participate in the richness of Fort Wayne&apos;s academic scene: IPFW (Indiana University-Purdue University Fort Wayne): In addition to a walkable campus, there are plenty of attractions to enjoy here. For those who never tire of learning, I recommend the Omnibus Lecture series. And speaking of walking, the university is situated on one of the city&apos;s three rivers. Take a leisurely walk and notice the native trees of Indiana. IPFW&apos;s RiverFest is another way to get involved. 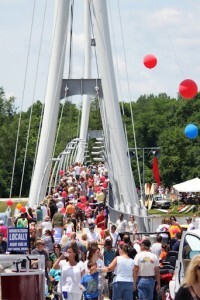 RiverFest is a one-day festival celebrating our rivers with music, art, family, food, and fun along the St. Joseph River on the IPFW campus. Mark your calendar for June 22! University of Saint Francis:(USF) USF&apos;s campus is equally as charming. Known regionally for its superb fine arts program, you&apos;ll want to check out the on-campus galleries. There is no shortage of talent here! In the fall, you&apos;ll want to see the Cougars football team take the field. Under Coach Kevin Donley&apos;s leadership, through the end of the 2012 season, the Cougars have sustained a string of 167 consecutive weeks in the NAIA Coaches Top 25 Poll, the longest current streak among all NAIA schools. Indiana Tech: Located just east of downtown, Indiana Tech is campus in growth mode. You can get a taste of the university&apos;s culture at Eclectech Music Fest 2013. Check out live, local music, farmers market, food trucks, community organizations, inflatables, games, and MORE! On a different note, the university is launching a law school this fall. These are just a few suggestions. There is plenty to be discovered on campus. Take in the beauty and welcoming atmosphere at any of these sites.